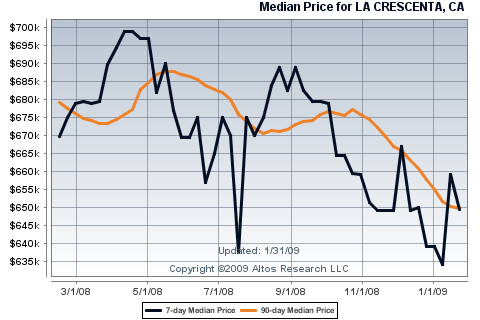 La Crescenta Homes Sales – what does a Buyer’s Market look like? The downside is obvious – price declines create stress and financial difficulty for many home sellers. The upside – low prices and low interest rates are creating great opportunities for buyers. 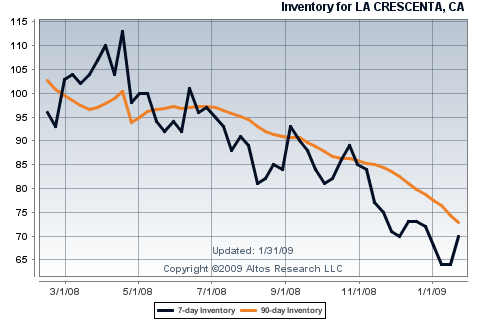 The “Inventory Chart” of La Crescenta homes for sale shows that sales have declined sharply since May of 2008. Declining prices cause many home owners to put off their plans and take their home off the market. As the number of homes for sale drops foreclosures and “short sales” dominate the market. These homes usually have a great deal of “deferred maintenance” – in other words they are fixers. The amount of work they require is the reason that the price has been heavily reduced. Even though there is a shortage of homes on the market in La Crescenta, the downward pressure of foreclosures and “short sales” has reduced prices from an annual peak of approx. $687,000 in May 2008 to their current lows of about $650,000in January 2009 – a drop of almost 6% in 6 months. In future posts we’ll discuss other areas as well. But, as a quick comparison prices went down about 18% over the same period for Sunland home sales and stayed almost level for La Canada homes sales. For more details on your neighborhood or to order your own chart info you can reach me via email at John@JohnHickey.com or by phone at 818-541-7311.